If you’re daydreaming about your next vacation, and looking for something a little off the beaten path, why not consider embarking on a global design tour? The world is full of inspiring destinations for travelers looking for a recharge, and you only need to do a bit of googling to plan a unique design vacation. Come along with Inhabitat for a brief tour of our favorite design destinations around the globe – from scuba diving to an amazing underwater art installation in Mexico to jetsetting to an ultra-modern designer hotel that towers over NYC’s iconic High Line park and meandering through the world’s largest wooden structure, which recently rose in Seville. 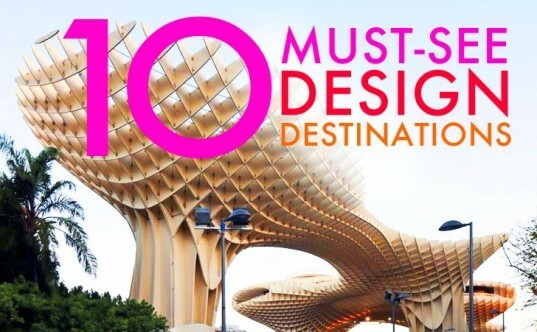 Read on for 10 of our favorite, must-see design destinations! Barcelona’s Parc Güell is a 100-year-old architectural and horticultural masterpiece by the city’s master architect, Antoni Gaudi. 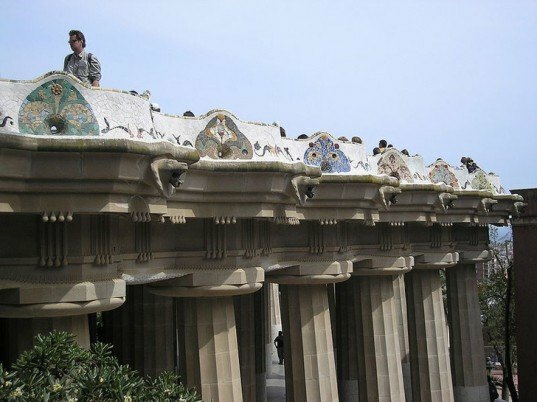 The gorgeous public park was completed in 1914, and perfectly exemplifies Gaudi’s fantastical signature style. Visitors are met with gingerbread-esque guard houses, which lead to the park’s infamous long and winding bench that snakes around endlessly in the shape of a sea-serpent. Aside from the colorful mosaics and architectural wonders, Gaudi designed the park to bring greenery to an otherwise barren hill in Barcelona. The park’s lush trees and plants are fed through Gaudi’s self-irrigating viaduct, which runs the entire length of the park and features nests for the park’s green monk parakeets. Parc Guell is a serene relaxation spot for locals and tourists alike, and is an incredible example of Gaudi’s architectural vision. The Standard Hotel in New York is much more than a place to rest your head at night. The gorgeous glass structure straddles the innovative High Line Park, an elevated railway originally constructed in the 1930s that has recently undergone a magnificent transformation. Redesigned by landscape architects James Corner Field Operations and architects Diller Scodifio + Renfro, the High Line is now a beautiful urban park that’s truly enhanced the surrounding areas, providing a covered space for vendors, cafes and art installations right in the middle of the park. 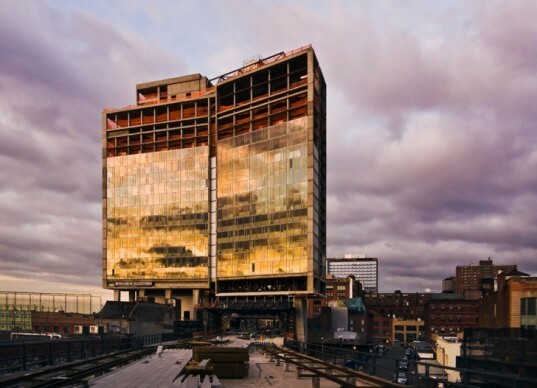 The Standard Hotel was designed by Gluckman Mayner Architects, and is a center for art, design, and food. Artists such as KAWS and Marco Brambilla have their pieces installed within the hotel, and other artists have collaborated with the hotel to create items available only at the Standard’s shop. In winter, guests can even ice skate on the hotel’s very own ice rink just below the High Line. Deep in the subtropical rainforest of Xilitla, Mexico, sits a surrealist jungle estate. Created for Edward James, a popular patron of the surrealist movement in the 1930s and 1940s, the estate combines 80 acres of natural waterfalls and pools that mirror James’ penchant for design. The grounds are covered with concrete surrealist structures that intermingle with beds of tropical plants and orchids. James lived there from 1949 to 1984, but now visitors can enjoy the grounds, which are maintained by the Fondo Xilitla, themselves. Since the decline of industry in the US, Milwaukee — a city previously known almost exclusively for brewing and manufacturing — has been undergoing its own renaissance, adding new tourist-worthy attractions and architectural masterpieces to its evolving skyline. Spanish starchitect Santiago Calatrava’s design for the Milwaukee Art Museum is as inspiring as the 25,000 works of art it houses. The concrete Quadracci Pavilion was the architect’s first completed project in the United States, and it includes a moving brise soleil that “opens” like a pair of wings to span 217 feet. The wings can then close over the structure at night or during poor weather conditions. 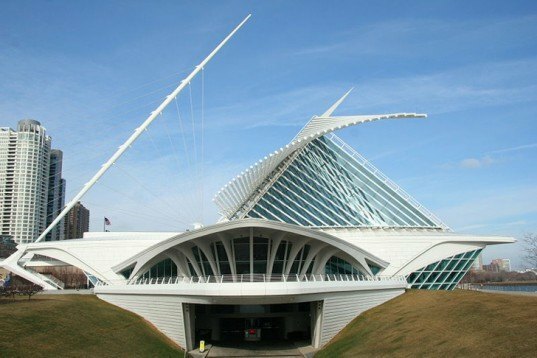 Since its construction the building has become the symbol of Milwaukee and change. 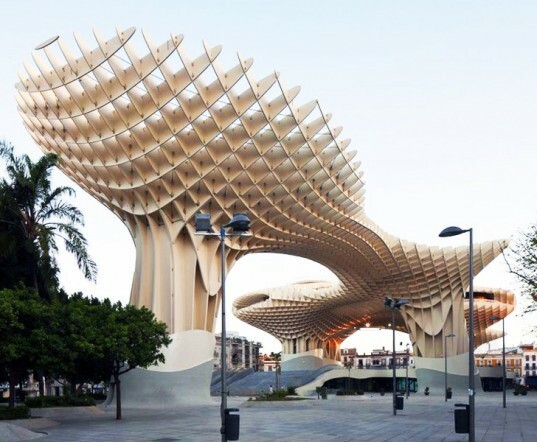 Jurgen Mayer H. Architects‘ spectacular Metropol Parasol was crowned the world’s largest wooden structure when it opened just last year in Seville, Spain. The undulating parasols of interlocking wooden panels provide shade to the open plazas, retail spaces, and cafes underneath. The sprawling canopies cover walkways and promenades in the Medieval portion of the city, and a museum, farmer’s market and elevated restaurant add to the richness of the historical city. The untouched beauty of Norway’s natural fjords, mountain landscapes, and aurora borealis were the inspiration for a series of look-out points commissioned for $377 million by the Norwegian government. The lookout points were created to encourage tourists and locals to enjoy the country’s natural beauty. Many architects, including Todd Saunders, Code Architecture, 3RW Works, Holmebakk Architechts, Manthey Kula and Juvet Hotel have designed elegant vantage points that bring visitors to the edge of beauty, without obstructing the landscape. 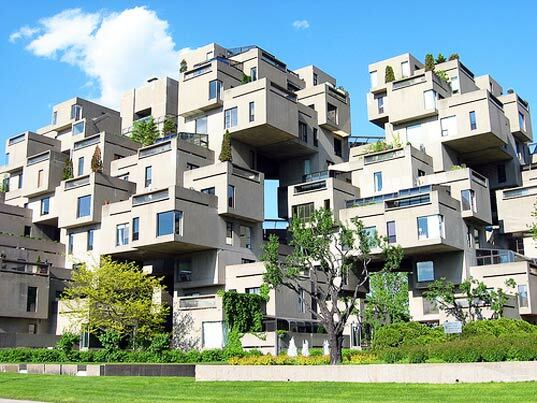 A stone’s throw from historic Old Montreal, Habitat 67, Montreal is composed of modular pieces that cantilever in many directions, forming a conglomerate of stacked apartment units. All of the units were prefabricated on-site, and each has its own rooftop garden space set upon the roof of the neighbor below. The vision is an ultra-modern mix of pixelated units that challenge how we think about suburbia. 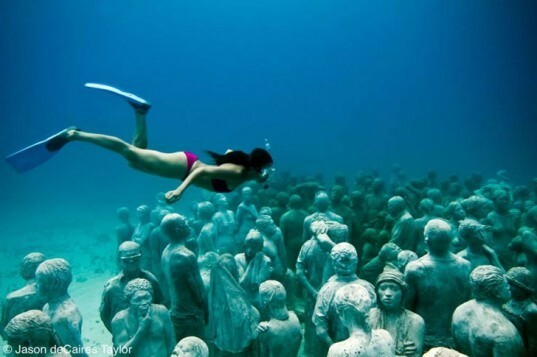 Just off the coast of Cancun, Mexico, but far from the typical “Spring Break” scene lies an incredible underwater, manmade reef of statues entitled ‘Silent Evolution‘. Created by artist Jason deCaires Taylor, this body of work is made up of 400 life-size human sculptures installed 30-feet below sea level. With this work, Taylor evokes feelings of sadness and awe, while also speaking to the complex relationship between man and nature. In addition to the sculptures’ aesthetic value, the artificial reef serves its nature made counterpart. As many coral reefs are currently experiencing life-threatening conditions caused by careless human behavior, artificial reefs are durable, environmentally friendly and offer relief as natural reefs attempt to regenerate. The sculptures are made from a pH-neutral concrete and reinforced with fiberglass that have proven to be surprisingly attractive to marine life. In addition to these materials, Taylor also rescues coral damaged by storms and humans by replanting them into the sculptures themselves. Iceland is sometimes perceived as a “flyover destination” on the way to tour the more famous highlights of Europe, but a design aficionado would be remiss to overlook this striking volcanic land of geysers, geothermal power, grass-roof homes, and modern architecture. Iceland’s capital Reykjavik is where the majority of the island’s population resides, and with only 120,000 people, but a strong cosmopolitan flavor, Reykjavik manages to feel both sophisticated and charmingly “small town” at the same time. Every visitor to Iceland should take the time to visit the incredible Blue Lagoon geothermal power station and spa. This natural geothermal wonder has been harnessed by human ingenuity to provide electrical power for the Reykjavik area, as well as attract locals and tourists alike with the world’s most stunning spa. In addition to copious natural wonders, Iceland also delights with unique architecture and inventive design. Traditional village houses all over the country are covered with grass roofs in order to provide shelter from the winds and cold. 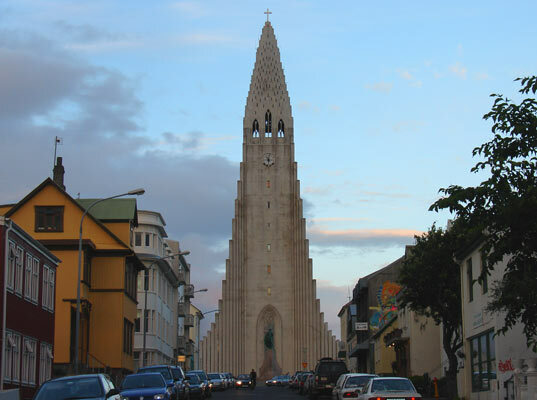 In stark architectural contrast to this, Iceland might the world record holder for largest number of crazy-looking modernist churches per capita. Reykjavik, skyline is dominated by the spacecraft-like shape of The Hallgrimskirkia (Hallgrim’s Church) — the city’s tallest building located positioned atop a hill. Tourists can easily find this architectural landmark listed in any guidebook, but what’s often overlooked is that in addition to The Hallgrimskirkia, Iceland has a wealth of wacky modern churches that are often missed by first time travelers. As far as design destinations go, Rotterdam should be at the top of the list for any contemporary architecture buff. From the iconic Ben van Erkel’s Erasmus Bridge, to housing the NAI, to the massive new MRVDV Market Hall currently under construction, this vibrant dutch city is a hotbed of design innovation. In the spring of 1940, the city of Rotterdam was demolished by the Luftwaffe during WWII’s German invasion of the Netherlands. Left with only rubble, the city began to rebuild and has since continued to reinvent itself to ultimately become the hub for architecture and design today. 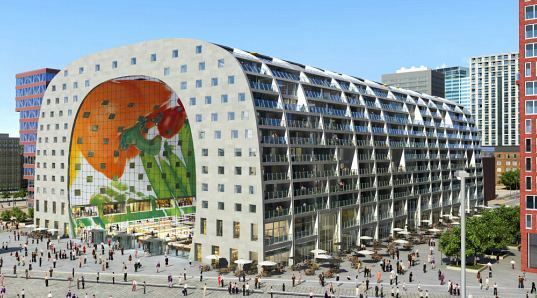 As the city continues to evolve, new attractions are constantly being added, like the incredible tunnel-shaped Rotterdam Market Hall. Designed by the boundary-pushing architecture firm MVRDV, this fun-looking building will become a 1 million sq foot tunnel with residences, a bustling green market, shopping, restaurants and more. Although construction is still underway, the Rotterdam Market Hall is something for both locals and tourist to look forward to. The surrealist sculpture garden looks incredible! Aww. I was just in Cancun. It would have been cool to check that out! a lot of places to add to my bucket list! I hope I get to see all of these some day. Have only been to 3 of these -- Seville & Norway are on my list. Wowza! One ticket to Spain please! 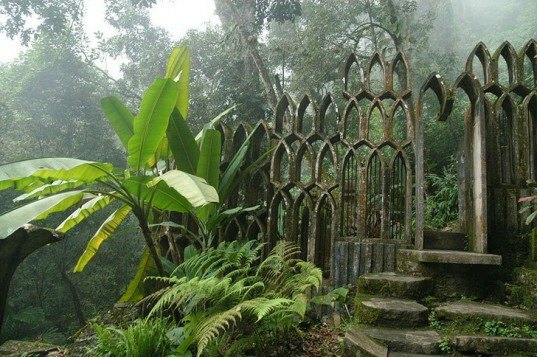 One day I will get to Las Pozas! I definitely want to visit Rotterdam. would love to dive to that coral reef. beautiful! If you're daydreaming about your next vacation, and looking for something a little off the beaten path, why not consider embarking on a global design tour? The world is full of inspiring destinations for travelers looking for a recharge, and you only need to do a bit of googling to plan a unique design vacation. Come along with Inhabitat for a brief tour of our favorite design destinations around the globe - from scuba diving to an amazing underwater art installation in Mexico to jetsetting to an ultra-modern designer hotel that towers over NYC's iconic High Line park and meandering through the world's largest wooden structure, which recently rose in Seville. Read on for 10 of our favorite, must-see design destinations! Barcelona’s Parc Güell is a one hundred year old architectural and horticultural masterpiece by the city’s master architect, Antoni Gaudi. The gorgeous public park was completed by Gaudi in 1914, complete with his signature fantastical style. Visitors are met with gingerbread house looking guard houses, which lead to the park’s infamous long and winding bench which snakes around endlessly in the shape of a sea serpent. Aside from the colorful mosaic architectural wonders, Gaudi designed the park to bring greenery on an otherwise barren hill in Barcelona. The park’s lush trees and plants are fed through Gaudi’s self irrigating viaduct, that runs the entire expanse of the park, in which Gaudi also built nests for the park’s green monk parakeets. Parc Guell is a serene relaxation spot for both locals and tourists, and is an incredible example of Gaudi’s green architectural vision. Deep in the subtropical rainforest of Xilitla, Mexico, sits a Surrealist jungle estate. Created for Edward James, a popular patron of the Surrealist movement in the 1930s and 1940s, the estate combines 80 acres of natural waterfalls and pools with James’ penchant for design. The grounds are covered with concrete Surrealist architectural structures that intermingle between beds of tropical plants and orchids. James lived there from 1949 to 1984, but now visitors can enjoy the grounds themselves, which are maintained by the Fondo Xilitla. Spanish starchitect Santiago Calatrava’s design for the Milwaukee Art Museum is as inspiring as the 25,000 works of art it houses. The concrete Quadracci Pavilion was the architect’s first completed project in the United States, and includes a moving brise soleil, which “opens” like a pair of wings, to a “wingspan” of 217 feet. The wings can then close over the structure at night or during poop weather conditions. The astonishing building has since become the symbol of Milwaukee as a whole. Metropol Parasol opened in Seville, Spain just last year, welcoming visitors to its open plazas, retails spaces and cafes. Designed by Jurgen Mayer H. Architects, the undulating parasols of interlocking wooden panels are the world’s largest wooden structure. The sprawling canopies cover walkways and promenades in the Medieval portion of the city, adding a museum, farmer’s market and elevated restaurant to the richly historical city. The untouched beauty of Norway’s natural fjords, mountain landscapes and aurora borealis were the inspiration behind a series of look out points commissioned by the Norwegian government themselves. Investing $377 million in the project, the lookout points were created to let tourists and locals enjoy the country’s natural beauty. 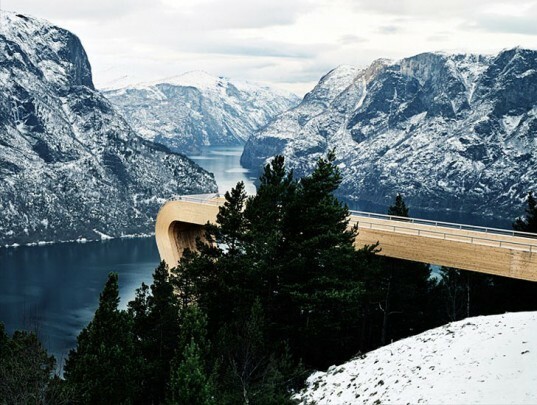 Many architects, including Todd Saunders, Code Architecture, 3RW Works, Holmebakk Architechts, Manthey Kula and Juvet Hotel have designed sleek vantages points that bring visitors to the edge of beauty, without obstructing the landscape.